Our motivations and vision must be grounded in prayer so we progress with a constant awareness of God’s will for the National Shrine Grotto. In prayer, we seek God’s voice and allow God’s word to penetrate our fear and resistance so that we can hear what God wants us to know. Please join us in prayer for the growth and restoration of the National Shrine Grotto so these holy grounds may be able to beat in unison with the hearts of Jesus and Mary, that wants to give life to their children. You may think an hour or two of your time is not worth giving to Our Lady’s shrine; however, a seemingly small act of generosity can grow into something far beyond what we could ever ask or imagine (see Eph. 3:20). You may make a pledge and pay in monthly installments. A monthly reminder will e send for the duration of your pledge period unless you are fulfilling your pledge via automatic credit card deductions. An outright gift can be made at any time during the appeal. To make an online gift or pledge click here! We want to recognize your generosity of a $10,000 gift or more to our Vision by memorializing your loved one. 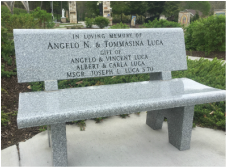 4' gray, granite benches sitting in gardens and reflection areas throughout the holy grounds.